Austin Anderson started his career performing with his family as part of their show “The Texas White Horse Troupe.” Austin’s parents, Don and Jo-Ann Anderson, founded The Texas White Horse Troupe in 1963. They performed at many venues such as rodeos, Wild West shows, state fairs, expos, and circuses. Austin debuted in the show as a Roman charioteer, riding in a custom made chariot made by his father to be pulled not by horses, but a pair of white German Shepard dogs. He eventually lost that spot to his little sister but by then he was acting out many of the routines in the show and got his own comedy pony act. Eventually, as a young adult he would move onto more traditional dress acts like Roman Riding, Trick Riding and his signature Bull whip Act. Austin went out on his own and continued to present quality acts at shows and events around the USA and Canada. His abilities as an all around horseman soon led to work in TV and film not only as a stuntman but also providing cast and stunt horses. Austin and his father continue to find enjoyment doing this type of work together. His family sets the bar high, so he works hard to bring quality acts with integrity to all of his shows and presentations. In 2004 Austin created “The Texas Trick Riders” show aimed at providing state fairs with a fast paced equine action show featuring trick riding and Roman riding with some western action sprinkled in. In 2007, Austin won reserve champion at the trick riding competition in Claremore, OK. and the Texas Trick Riders finished 2007 as champion team. Austin embraced the idea of competitive trick riding and gained new perspective on trick riding. However the competitions would not continue for the next several years and Austin set out to teaching new students to trick ride. Austin felt the time was right to pass on what he has learned to new riders and ensure they get started in the right direction. When not on the road performing, Austin works at the family ranch. Along with training the horses, there is hay to haul, fences to build, tractors and equipment to maintain, and pastures to mow. The usual ranch related work. 2015 saw a return of trick riding competitions and gave Austin another chance to be involved in competitive trick riding . Austin won the Texas Open Trick Riding contest and that gold buckle that comes with being a Champion. Austin rode competitively for another year, then turned the focus entirely on coaching. Austin continues to work as director for the Texas Open and coaches riders involved in competitions throughout North America. Including the winner of the 2017 Contest. Austin enjoys production and performing and combines the two with his direction of the Texas Trick Rider shows. If it's a rodeo or horse expo, clinic or state fair, the Texas Trick Riders Show has been a very popular attraction. The goal is always to provide a quality presentation. Austin says: " When quality counts , Count on us"
Most people would think Chelsea grew up on a horse ranch after watching her perform, however horses were just a dream to this little girl growing up in the suburbs of Detroit . Chelsea would have to wait until the age of 12 to get her first riding lesson as a gift from her aunt, at a near by jumping horse stable in Eastern Michigan where she soon realized horses would become her passion. A passion she would fund by working odd jobs including paper routes. Actually a rare thing for a kid in this day and time. Her senior year of high school she found work galloping race horses at a near by trainer's barn. She loved going fast and the excitement of all things involving the preparation of horses for the track. She was accepted to Michigan State University in 2010 and immediately she joined the Rodeo Team both as a competitor on the MSU rodeo team and as a committee member for the Rodeo club. She was granted a Rodeo scholarship her Sophomore year and competed in barrel racing on the collegiate circuit. She completed her degree in Spanish and began teaching but soon realized a career spent indoors was not for her. In the summer of 2015 she set out to find work in the horse industry again. She answered an add for a Canadian performing troupe, the Encore Presentation Trick Riders, looking for a trick rider for the summer. She learned the basics of trick riding and performed with the troupe for their summer run across Canada, culminating with a performance at the Canadian National Expo. She immediately fell in love with trick riding and entertaining. As the season drew to a close she again found herself looking for fall and winter work. Determined not to return to a classroom, she hired on with a racing trainer in KY. Again working with the race horses was enjoyable but not filling an inner passion. She would pack up and move to Texas to train with Austin Anderson and perform with the Texas Trick Riders. Here she developed skills not just in trick riding but also in training liberty horses and roman riding. She has trained several liberty horses and the Roman team she performs with. Chelsea has performed with the Texas Trick Riders at many shows including the California State Fair, the Horse World Expo, The Oklahoma State Fair, the Haras Cup and the San Antonio Stock Show. Since Joining the Texas Trick Riders she has become a featured performer with presentations that include Trick Riding, Roman Riding and her signature Trick shooting. When not on the road performing Chelsea trains horses for clients, breaking colts. She also volunteers her time as a mentor and advocate for youth in the foster care system. Garrett began his trick riding in 2007 when his mother brought him to Austin Anderson. Garrett was 14, he would train weekly, rain or shine.... lots of bumps and bruises along the way but after a year he was asked to perform with the Texas Trick Riders at the Minnesota State Fair. Riding his fast little appaloosa horse, Garrett was a hit with the crowds. He was hooked on the life style. Garrett soon realized it was not all fame and glory as over the next couple years Austin would not only coach him, but have him help around the ranch with all things Ranch life required. In 2009 Garrett performed a summer run of 10 weekends, 4 shows, Saturdays and Sundays at the famed Fort Worth Stockyards as the trick rider at the Pawnee Bill wild west show. A show Austin Anderson Directed and performed in as Pawnee Bill. After that season Garrett would travel out of state, as his family's work took them to New Mexico. He worked on a New Mexico ranch as well as various odd jobs but always wanted to return to trick riding. 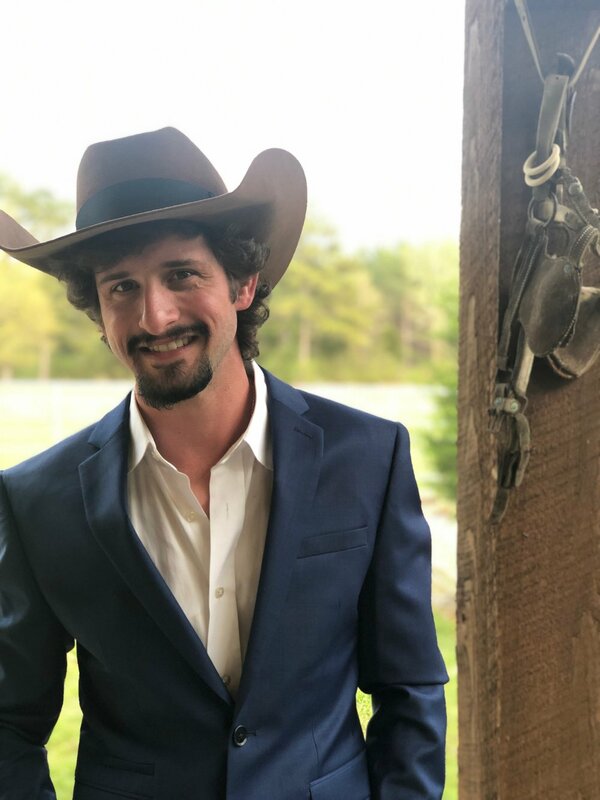 At the age of 21 he took the necessary steps to get back to Texas and with the Texas Trick Riders, staying with his grandparents while working to get a degree in the welding trades. He completed the needed classes at both Stephen F. Austin and Kilgore college found work and returned to training as a trick rider. Timing would be fortunate for Garrett as he gained the opportunity to ride competitively in 2015 at the newly formed Texas Open trick riding competition, at the time it was the only trick riding competition sanctioned. He would ride with and see his coach Austin win the men's division and was determined to become a top rider himself. The 2017 Texas Open Champion. He travels to competition with Ginger Duke a champion lady's trick rider in 2007 and current competitor in the NATRA. Garrett credits her and Austin for his opportunity's to both perform with and compete. Garrett currently trains for shows and competition with the Texas Trick Riders as well as holding down two jobs. He is 26 years old from Tyler Texas. Born in the foothills of Coshocton County, Trevor grew up on his parent's horse farm just outside of Plainfield, Ohio. 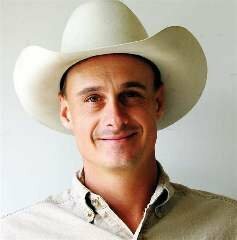 His older brother had been competing in high school rodeos, riding bulls and broncs. Trevor was too young to compete at the time, so he would tag along with his brother to the rodeos to watch him compete. The rodeo lifestyle instantly began to course through his veins. Then his mother introduced him to a short piece of rope, called a piggin' string. She managed to create a small, spinning flat loop that caught his eye. Who knew that, at that moment, a trick roping career would transpire. One Christmas, his parents gave Trevor a black and white movie, called "The Ropin' Fool" starring the infamous trick roper, Will Rogers. He began teaching himself numerous tricks just from watching Will Rogers on the film. Within a couple years, Trevor was performing his very first trick roping show at the local Coshocton County Fair. Soon after, he was performing at high school football game halftime shows, trick roping and singing in show choir performances, local theaters, fairs and festivals, and at school assemblies all across the state of Ohio. Before long, he was singing the National Anthem and trick roping at rodeos in Ohio, Indiana, and Pennsylvania. The young cowboy always knew from an early age that he wanted to entertain on stage in front of live audiences. His ultimate goal was to land a recording contract in Nashville, Tennessee. So he and his oldest brother decided to start a country band to sing and play music for local venues in their hometown area. His brother, already an established songwriter, taught him songwriting technique. Before long, they had co-written a song together that is Trevor's very first single release called,Slide and ride. In 1995, Trevor began touring with Austin and his family on Texas White Horse Troupe show. That year Trevor competed in the Wild West Arts Club National Convention in Scottsdale, Arizona for western entertainment, and walked away with Trick Roper of the Year! Trevor's career continued to flourish and his list of performances grew to include 3 years at the Ponderosa Ranch, home of "Bonanza, a NBA halftime show for the Houston Rockets and the Dallas Mavericks and the official NFL Super Bowl XXXV Pre-game Party in 2001. He was even featured in a national television commercial for ESPN SportsCenter. In 2001, The Walt Disney Company invited Trevor to become part of their entertainment family in Mickey's Backyard BBQ Dinner Show at Walt Disney World Resort, where he has spent the last 16 years as the featured act in front of countless sold-out audiences. Aside from currently appearing nightly at Disney, Trevor still spends every summer on tour with Austin Anderson's, Texas Trick Riders wild west show. Trevor currently has his very own country music show, complete with a five piece band of some of the country's finest musicians, on board the ever-popular, Victory Casino Cruises, sailing out of Port Canaveral, Florida.